You'll like this car if high mileage is a must and regular is your gasoline of choice; its 25/33 city/highway EPA fuel economy numbers trump the Volkswagen Rabbit's, for example. 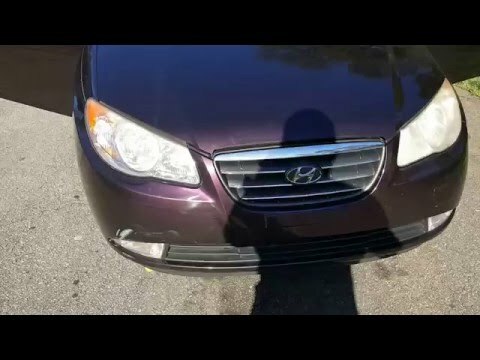 If safety is your issue, the 2008 Hyundai Elantra offers front, side-impact and side-curtain airbags, plus antilock brakes (ABS), as standard equipment. Inexpensive reliable car with a few issues. It's a nice little car, reasonably priced, with one of the best warranties in the industry. At 115k miles I've never had any real mechanical problems. I have had a problem in which the passenger door has been rusting for several years and is almost rusted through. For even longer than that I've had an issue where the visors fall out of the ceiling. This happened when the car was only a few years old but the visors were all out of warranty. It is rather unforgivable that this wasn't a recall since it usually happens when driving, causing the driver's view to be obstructed without warning. I eventually had to remove the visors altogether. I looked into replacing them, but they are over $200 each just for the part. It is not good for a big family pretty small. I think it pretty good on gas and has a lot of storage space. Nothing fancy, but it's reliable. All the essentials: AC, power locks and windows, and a radio with an aux port. I was in one crash, where the hood latch came undone spontaneously, and the hood came up and smashed the windshield. I don't think this was a fault of the model of the car, I already had 80,000 miles on it at this point. I now have 92,000, and the battery seems to die when parked for long periods of time (1 week). I think this is just normal old car things as well. AC always worked great, no problem with windows opening or closing, all power lock doors are great, no problems with breaks, etc. Relatively fuel efficient, I still get 27 MPG. My dad gets 36 MPG somehow! I think he's very good at being fuel efficient.